1958 Epic Series Telecaster Vintage Reproduction. A faithful 100% reproduction of a real 1958 telecaster pickup set. - 1958 Epic Bridge Pickup, using 1958 Original Alloy Magnets, 42 Enamel wire, wound just like the original with all the scatter mojo. 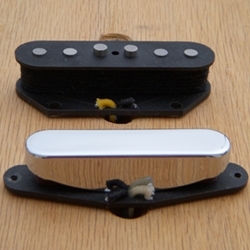 - 1958 Epic Neck Pickup, using 1958 Original Alloy Magnets, 43 Enamel wire, wound with scatter mojo and a chrome cover.